Nanomedicine is a very rapidly emerging field, in which nanotechnology is employed in connection to medicine for different applications (single-molecule recognition, high-sensitivity screening test, etc.). In this context, in the last years, magnetoresistive sensors have been proposed as core technology of several platforms for biological investigations. Tools combining sensors based on magnetic tunneling junctions (MTJ) with magnetic markers have been widely studied in order to detect concentration of specific molecules. Because of their high sensitivity, they are considered to become a promising alternative to widespread fluorescence-based biosensors. In this framework, the detection of hybridization events involving natural DNA via a MTJ-based biosensing apparatus is under study. Two main applications are envisage, i.e., genotyping and early stage diagnosis. Pathogen (e.g. Hepatitis E Virus, Listeria monocytogenes) genotyping is a critical issue in agrifood industries, which requires the use of fast and portable platforms for field-tests. The second main biosensing application is related to the detection of mutations of KRAS gene, connected to the development of lung cancer. In this case, a high sensitivity is required in order to detect few mutations in circulating DNA. 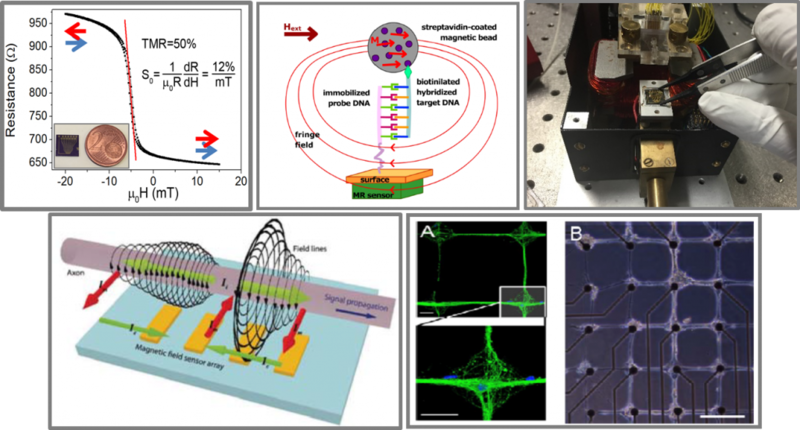 Furthermore, due to their high sensitivity to weak magnetic fields, magnetic tunneling junctions represent a promising alternative to conventional platforms for the detection of in-vitro neuronal activity. Arrays of magnetic sensors are developed in order to record propagating spontaneous and evoked network activity in primary in-vitro cultures of hippocampal neurons and in acute cortico-hippocampal brain slices at unprecedented spatial and temporal resolution, studying physiological and pathological responses of the network to distinct stimulation frequencies applied over different temporal windows.